Its add "Set" order in your inventory and sort all gear by set name. The addon is not perfect but its works for me and i decided to share it here - could be useful for someone else. This addon is based on another addon (QualitySort by @Randactyl). Having QualitySort is not required but both addons can work together. Sorting button is now available in the house storage. Thanks to /bilarion/ for the code. Added addon settings panel. Now you can change order criteria. Last edited by mikra : 11/03/18 at 02:22 PM. This is the best thing thats happened to me. Ever. Thank you for making my life 120020x easier. (my question further down) This is one of the most useful addon I'm using. Elegantly simple. Personally I don't need fancy grid-like sort of all sorts and searches : I need to sort by sets (and then some via the other configurable sort criteria), that's all, and see the names along the little vanilla icon beside them. Other addons offer a search function so as to slim down the list to whatever you want including set names, but that's not relevant for me as I don't remember every set names, and I need to sort the lists not trim them down (especially when I micro-manage my inventories so as to make room). Thanks and kudos ! One question though : 10.0.0.4 is supposed to be an update for Dragon Bones, however the new home containers aren't addressed by this addon. Is there another update in the works ? Since I don't play the game anymore, I just update addon to work with the current client of the game, I don't have time to add new functionality for now. Last edited by HawkFest : 02/28/18 at 09:02 AM. Love the addon, hope it gets updated soon. Would love to see the various sets in collapsible menus. Last edited by Fish : 02/13/18 at 04:22 AM. What does it mean "the addon is not perfect" does it bug out? Also does it take into account Named sets like "Waldo's Staff of Wabajack" which is really a part of a set of totally different name "Ebon Set" for example. 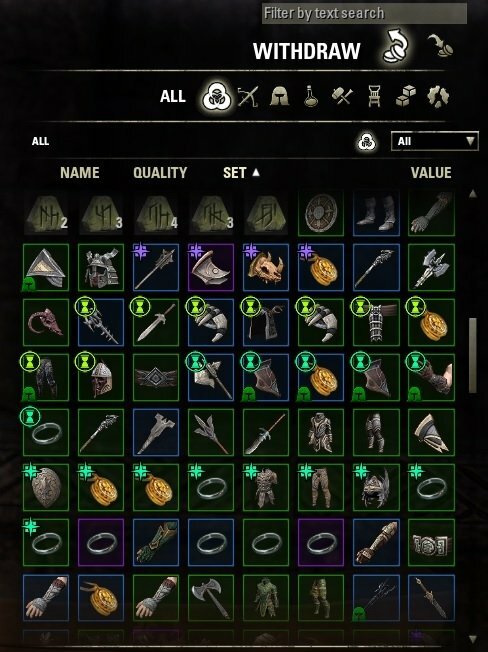 Why are all you people asking for insignificant sorting options, I would just be happy to have all pieces of the same set grouped kinda like what Inventory Insight does when you search, they also found a way to look at the actual SET NAME not the titles as ZoS is very inconsistent with their naming conventions. Mby i do smth wrong, but i have a mistake with sorting from this addon. For example, i have a lot of items from Ebon set. They are blue and violet quality. When i sort it i see: blue helm, blue helm, ...other blue Ebon items..., violet helm. 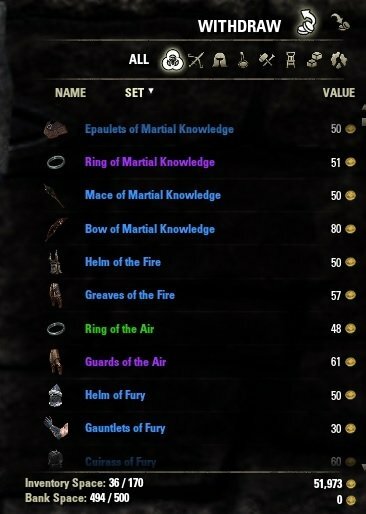 The "Set" button is available on category: Consumable, Master Writs. Maybe I have the settings wrong, just installed the Addon, they are still as default. 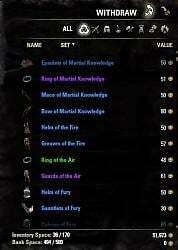 The Master Writs are not sorted by Set when the Set button is clicked. It really would be very helpful to have these sorted/grouped by Set name. I collect them on 1 char during the week and end up with about 60+ for a crafting session the end of the week. My intention is to save time on running around and repeat visits to the same craft stations. Last edited by Onigar : 07/18/17 at 10:39 PM. Re: Re: Re: Re: Re: Name order within each set? OK, i'm working on Settings panel in which you will be able to change order criteria (by 7 item attributes). Re: Re: Re: Re: Name order within each set? That still leaves the Item Type order in the picture. It looks almost alphabetical-up (which is just a toggle in the vanilla inventory tab) but the Martial Knowledge items are not. Is it following a game code order? If it is your code only can I make a personal modification to change the order to my own? about Martial Knowledge, i dont get it. What is wrong with it? for me its looks pretty much ok, since its name is "Way of the martial knowledge"
If you look at that Martial Knowledge sort it is showing, from the bottom, Bow - Mace - Ring - Epaulets. If that is alpha upward then why is Epaulets after Ring. If it is by gear type I guess it might be following Armor then Weapons downward and then Alpha after that but then but Bow should come before Mace Downward. 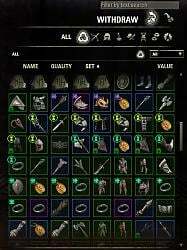 I have read that every ESO item has a unique Item ID and you may not be able to apply alpha sort in all instances so at least the sets together at this point is much appreciated. Re: Re: Re: Name order within each set? Last edited by megawriter : 05/09/17 at 08:49 AM. Re: Re: Name order within each set? Just asking before I try this out. The Picture you have does not have the sets in Alphabetical first word order within each set. How are items ordered within each set? Is it following anything at all? Set Name -> Item Type -> Quality -> Item Name -> Level -> CP Level -> Trait -> Enchant -> Style. Last edited by Sp00sty : 04/29/17 at 01:34 PM. Re: Name order within each set?